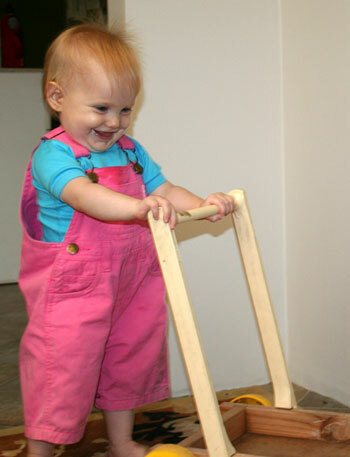 Calista turns one at the end of this month and is confident in walking (as long as she’s still holding on to something). Her hair has a trace of ginger but is quite strawberry blonde like Brioni’s. She loves bouncing in David’s arms, playing with a ball track house, and looking through books. She’s recently learned the wonders that come from turning the pages of a book and will sit for a long time in front of the bookcase and flip randomly through books. Calista is thoroughly bonded with her comfort rug, which we call “Pink Robot” and a favourite game is to be carried around from room to room, looking for “Pink”. She is starting to sign and recognises some body parts. This age of awareness is so exciting!